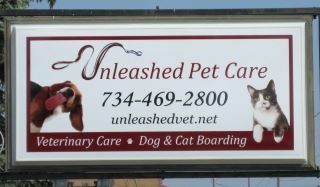 Unleashed Pet Care provides individualized veterinary care to animals in the Westland/Livonia and surrounding area of Southeastern Michigan. We're located on the West side of Middlebelt just South of Joy Road. We understand the special bond you share with your faithful companion. It is our goal to preserve and strengthen that bond using modern veterinary medicine and old-fashioned care, compassion and respect. Our first priority is wellness care to keep pets from getting preventable disease. This combines an effective vaccination strategy with heartworm testing and prevention, control of intestinal parasites, fleas and ticks. At Unleashed Pet Care, we treat your pets like the valued family members they are. "Dr. Nugent has always gone above and beyond for the care of our family's pets for several years."